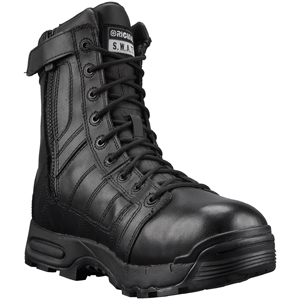 For security professionals operating in inclement weather, the Original SWAT Metro Air Men's 9in Side-Zip 200g Insulated Tactical Boot 123401 provides the ultimate in protection. This boot includes 200 grams of Thinsulate insulation for sub freezing temperatures. This boot has a integrated waterproof bootie to protect you from rain and standing water. An all leather upper ensures a top uniform appearance at all times. This tactical boot includes several comfort features that include a removable custom fit EVA insole,custom-molded phylon EVA midsole for lightweight comfort and cradled support, and Texon stability platform for lateral support and torsional rigidity. This boot is ideal for work around x-ray machinery and is airport friendly with a nylon shank, instead of steel. A durable, slip and oil resistant, non-marking cold weather outsole formulation provides traction and pliability even in icy conditions. For quality tactical boots, law enforcement professionals look to Original SWAT for the most advanced technology on the market today.